The federal government appears to be considering a budget announcement that would allow first-time homebuyers to obtain 30-year insured mortgages, up from the 25-year limit now, according to the Canadian Homebuilders’ Association. Such a move would represent a change in direction after more than a decade of measures by federal Conservative and Liberal governments since the 2008 recession aimed at cooling housing markets and encouraging Canadians to take on smaller mortgages. Minister of Finance Bill Morneau stands during Question Period in the House of Commons on Parliament Hill in Ottawa on Tuesday, Feb. 5, 2019. While the Bank of Canada continues to express concern about high household debt, politicians are also getting an earful from younger Canadians – a potentially key voting demographic – who can’t afford to enter the housing market. 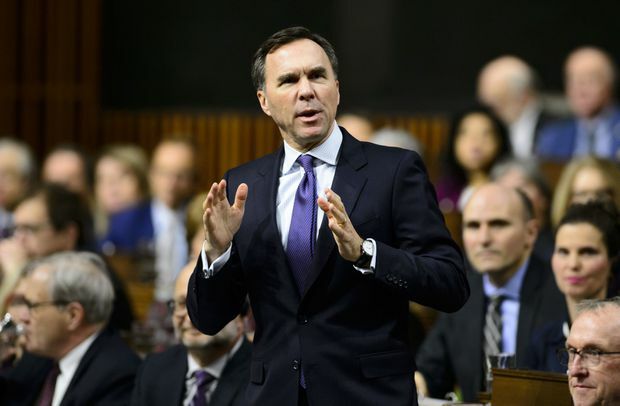 Finance Minister Bill Morneau’s coming budget will be the government’s last before the scheduled October election. The minister recently said he is looking at home affordability issues for millennials, but he has not publicly speculated on potential policy options. Over the past two weeks, top officials from the Prime Minister’s Office and Mr. Morneau’s office met with Kevin Lee, the chief executive of the Canadian Home Builders’ Association, to discuss potential budget measures. Association spokesman David Foster said there is clear interest from government in the request put forward by housing industry groups to bring back 30-year insured mortgages. “They keep wanting to talk with us about it, and it wouldn’t cost them a dime, so I’ve got to think those are somewhat positive signals,” Mr. Foster said on Wednesday. The association discussed the matter earlier this week with Mr. Morneau’s chief of staff, Ben Chin. They also met last week with Sarah Hussaini, a policy adviser in the Prime Minister’s Office. Pierre-Olivier Herbert, a spokesperson for Mr. Morneau, declined to comment, saying the office does not speculate on potential budget measures. The association has had several meetings with officials and MPs over the past year in the run-up to the 2019 pre-election budget and recently narrowed down its wish list to just two items: a return to 30-year insured mortgages for first-time homebuyers and an easing of stress test measures that restrict access to non-insured mortgages. Mr. Foster said officials are expressing interest in both options, but especially the 30-year mortgage proposal because it can be enacted unilaterally by the Finance Department. Changes to the stress test would require the co-operation of the Office of the Superintendent of Financial Institutions, an independent regulator that just this week defended the existing rules. MP Francesco Sorbara, who chairs a Liberal caucus on housing affordability issues that formed last year and is a member of the House of Commons finance committee, did not dismiss the 30-year mortgage proposal as a way of helping first-time homebuyers. “It is one idea of many that is worthy of consideration, with the caveat that we maintain a secure and healthy housing market and that individuals are not overextending themselves,” he said. Paul Taylor, president and CEO of Mortgage Professionals Canada, is also advocating for the 30-year mortgage option and said he was “encouraged” by Mr. Morneau’s recent comments about addressing affordability for millennials. However, Mr. Taylor said he has not received any indication from federal officials that a decision has been made. The date of the budget has not yet been announced. The House of Commons only sits for one week in March, which makes the week of the 18th a likely window for the minister to deliver the budget. However, there is also speculation in Ottawa that the budget could be released in the final week of February. Homebuyers with a down payment of at least 5 per cent of the purchase price but less than 20 per cent must be backed by mortgage insurance. This is offered by the Canada Mortgage and Housing Corp. – a Crown corporation – as well as two private insurers. In 2008, after briefly allowing insured mortgages with a 40-year amortization period, then-Conservative finance minister Jim Flaherty reduced the maximum period to 35 years. The Conservative government lowered the maximum to 30 years in 2011 and acted again in 2012 to bring it to 25 years, where it has stood since. The moves were promoted as a way to prevent high-risk borrowing. Shortly after the Liberals formed government in 2015, Mr. Morneau announced further mortgage tightening rules that December by doubling the size of the required down payment for insured mortgages for the portion of a home’s value from $500,000 to $1-million. Mr. Foster, of the home builders’ association, said restricting insured 30-year mortgages to first-time homebuyers should prevent consumers from getting in over their head. Millennials have most of their working years ahead of them and would likely pay off the mortgage sooner than 30 years, he said.